5Dimes sportsbook offers a wide variety of deposit methods. The most popular method is credit cards; you can use Master Card or Visa. The minimum amount you can deposit with this method is $50, while the maximum is $500. However, 5Dimes might restrict your deposits at first. Other deposit methods are Money Gram, RIA, Western Union, but we recommend using Bitcoin for two reasons; it is fast and free, and you won’t have a limit to the amount of money that you can withdraw in Bitcoin, if you make a deposit via that payment method. When it comes to withdrawals, 5Dimes options are somewhat restricted. You can withdraw your money by checks, but the limit is $1000. Person to person transfer is more affordable, with a limit of $100. However, the best way of withdrawing the money is Bitcoin. If you made your deposit via that method, you can get a free, limitless withdrawal! 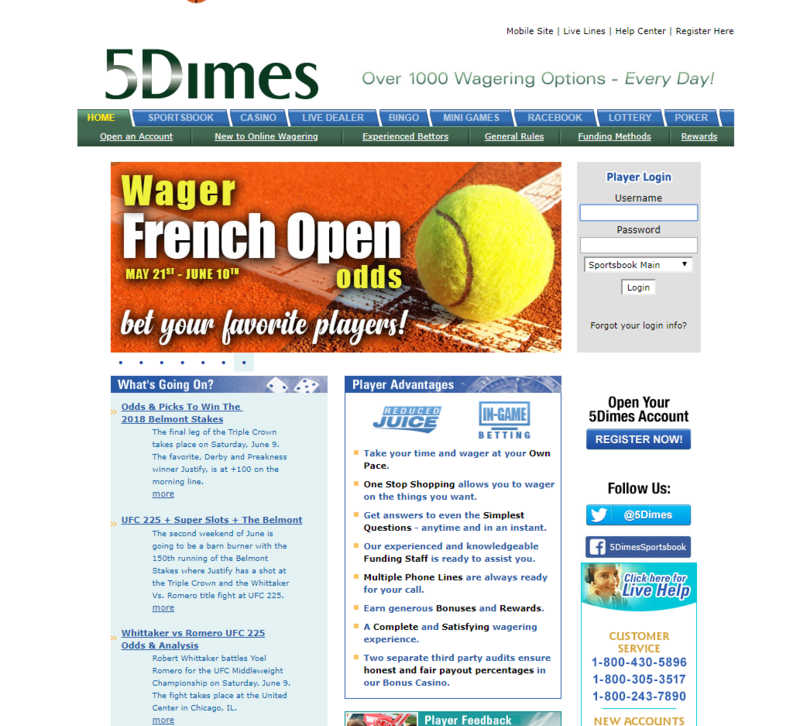 5Dimes really excels here; the interface is clean, easy to navigate and good-looking. Even though they offer a wide variety of markets and betting options (which is certainly positive!) everything is well organized and easy to find. 5Dimes requires reentering the password after the bet is waged, so the bettor can be sure that he made the right selection. This might irritate some users, but we think that option is very useful. Unlike the desktop version of the website, the mobile version is not that great. It is functional, but it looks outdated and some users might find it ugly. 5Dimes odds and limits favor both professional and recreational bettors. Professional bettors will love their early lines, especially on MLB; here, they can find probably the best odds in the US. Recreational bettors will love their betting minimum, it is only 50 cents! This is the lowest betting minimum in the US as well. 5Dimes welcome bonus is hefty; it is 50% up to $520 on your first deposit! You will get a reduced juice offer as well, which is valid for several sports betting markets. 5Dimes sportsbook is very interesting option for US-based bettors. It is great both for betting professionals and casual bettors, they have great support and they have been around for a very long time. They don’t have the best looking mobile website in the industry, but they are certainly worth checking out.